Sometimes I think this narrowboat building is just like eating an elephant…. How? One mouthful at a time! The stern gear is now installed after Andy spent a few hours struggling with the Vetus dripless bearing and the Python Drive. You may have noticed the drive shaft has now been cut to length! 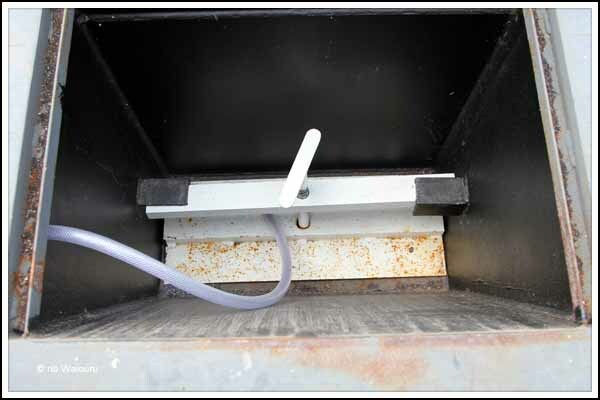 The hose from the dripless bearing has been routed up behind the domestic battery bank and into the top of the weed hatch on the starboard side. Andy is going to fit a skin fitting into the top of the removable weed hatch so the end of the hose is below water level. 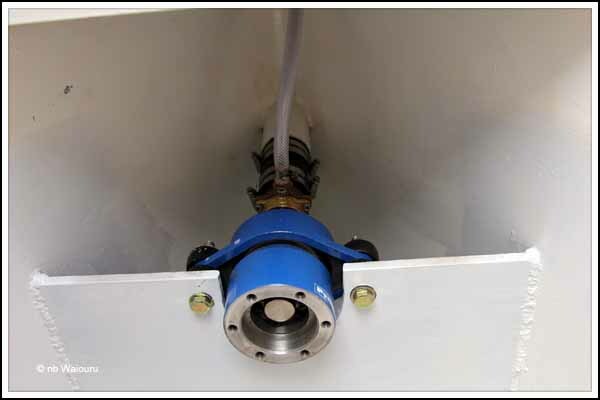 I understand the purpose of the hose is to vent surplus air/water from the Vetus dripless bearing. However Andy indicated it was also used to draw water into the bearing to cool it. The only issue I can see is a potential obstacle with the hose when trying to go down the weed hatch to clear a fouled propeller. If that occurs I may cut the hose and insert a couple of snap garden hose female fittings and a male-to-male coupler into it. The domestic battery bank as also been fitted and the individual batteries wired together. The cables connecting them in series/parallel are 120mm2, which is fairly substantial. In order for me to check the level of electrolyte I’m going to have to start looking for a small dentist’s mirror. I had sent a couple of queries off via email regarding the cost of automatic battery watering top-up systems but the cost was prohibitive! 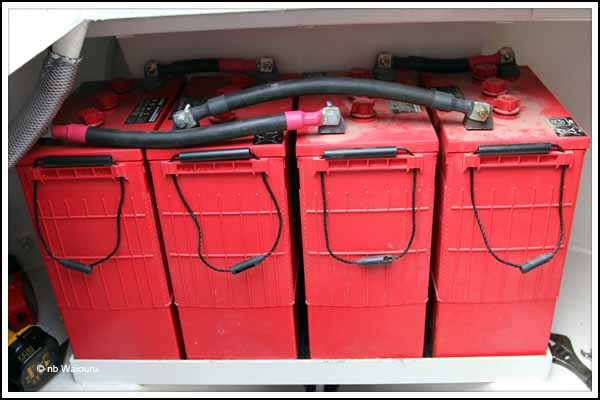 The four 450VA Rolls deep cycle lead acid traction batteries give us 900VA but only 50% (450VA) is usable as lead acid batteries can have their life significantly shortened if discharged lower than 50% of their maximum capacity. The bilge pumps have arrived. Andy is going to fit the one in the engine compartment whilst I will probably wire the one for the bilge in the bow tomorrow afternoon. I’ve also been given another Empirbus document to read. This one covers the GSM/GPS configuration. It looks rather complicated, however I guess I’ll eventually work it all out! Nick, the engineer, is working tomorrow and Andy has advised me today he will be tasking Nick to fit the Hurricane heater and the hospital silencer into the engine compartment. Type "inspection mirror" into the e-bay search, you will get lots of choice !